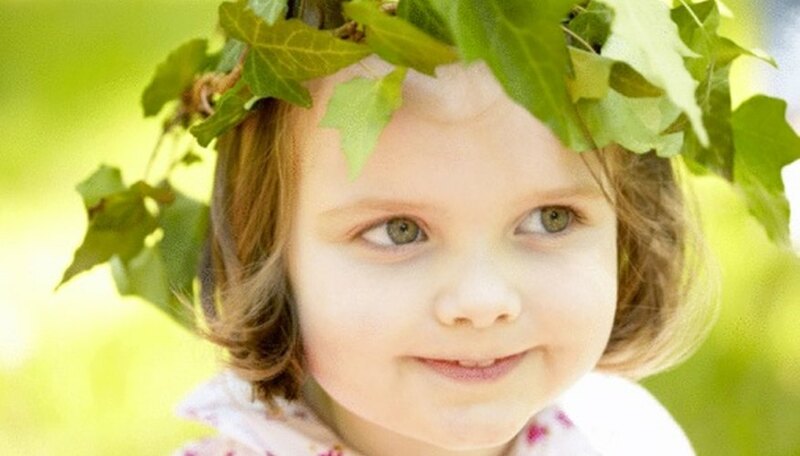 The myth surrounding the laurel wreath is a wonderful basis for kids' craft activities. You may want to preface the activity by reading the Greek mythology to them. As they listen to the myths they may imagine themselves as Hercules, Apollo or a Greek goddess. Whether the wreath is created from a paper plate or an actual bay laurel, the child wearing it will have his own story behind it. The laurel wreath is connected to the Olympics. Preface the activity with a story about the Olympics and how Hercules started them to honor his father after his death. To make a simple head wreath, get 9-inch paper plates, scissors, paste and green construction paper. Ask them to cut the center of the plate out, leaving a ring for the wreath. Cut leaves from the construction paper and paste them onto the paper plate ring. Allow time for the paste to dry before they place them on their heads. A variation on the full head wreath is the headband wreath that fits on the back of the head. Using a plastic headband and a sheet of green craft foam, scissors and a glue gun, you can easily help your children create their own Olympic laurel wreathes. Each wreath needs one headband and one sheet of green craft foam; a typical sheet of the foam will be enough to cut out approximately 35 leaves. Cut the green craft foam into shapes of leaves and attach them to the headband using the glue gun. This type of wreath may be worn covering the front of the forehead or in the opposite direction to cover the back of the head. To make a bay laurel wreath, you will need to purchase or forage from your own backyard bay laurel branches. The branches, along with some thin wire and scissors or wire cutters, is all you need to make an authentic laurel wreath. Simply attach the bay laurel together using the wire and trim off any excess branches. You may want to have add some ribbons and bows streaming down the sides and back of the wreath. The gold medal used for the Olympics has a laurel wreath on it. First, find an image of a gold medal that you can use as your pattern. For each gold medal, you need a frozen juice can top, 6 inches of red, white and blue striped ribbon, papier-mache and gold spray paint. Cover the juice can top with papier-mache and include the imprint of the laurel bay leaves along the bottom edge. For the imprint of the laurel bay leaves ,you may be able to find evergreen pieces to paste on the can or pieces of cardboard cut into the shape of bay leaves. Kids can add a star in the center, or any other embellishment they choose. Allow the papier-mache to dry and then spray it with the gold paint. Once the paint is dry, use a glue gun to attach the ribbon to the top of the medal so that it can hang around the child's neck.